Chem Soc Rev is the home of high impact reviews from across the chemical sciences and publishes accessible, succinct and reader-friendly articles on topics of current interest. If you are interested in writing a review, you can submit a review proposal form to Chem Soc Rev for the Editorial Board’s consideration. Here are some of the latest referee-recommended articles published in Chem Soc Rev – all free to read until 17 April! Take a look at this selection of recently published referee-recommended articles – all are free to read* until 23 January. Take a look at this selection of recently published referee-recommended articles – all are free to read* until 23 November. Chem Soc Rev was delighted to sponsor a poster prize at the recent Supramolecular Chemistry Symposium at Southampton University. Congratulations to the winner, Marc Little from the University of Liverpool! 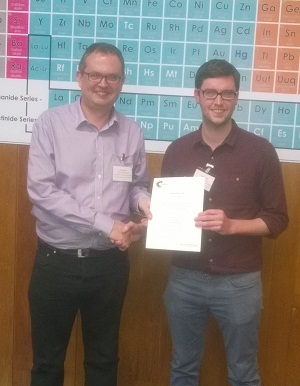 Chem Soc Rev Editorial board Chair and Southampton Head of Chemistry, Phil Gale, presented Marc with his certificate. The Symposium, held on the 17th June, featured a great line-up of speakers including several RSC Prize and Award winners, with Matthew Fuchter, David Leigh and Andy Cooper all giving a lecture at the event. You can view the full programme and list of speakers online. For more photos and information about the event, head to the symposium website. Congratulations again to Marc on his Chem Soc Rev poster prize.